Black Labs tend to shed more than yellow Labs. Despite their short fur, Labrador retrievers tend to shed a lot. Dry, flaky skin can make shedding worse and may cause your dog to constantly lick and even pull out his fur. While it's not possible to completely eliminate shedding, you can significantly reduce the amount of fur covering your house. Talk to your veterinarian if your dog has suddenly developed flaky skin and excessive shedding. This could indicate an allergy, yeast infection or other skin condition. 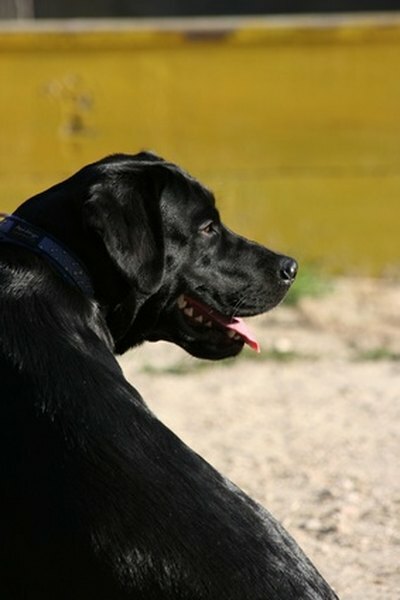 Labrador retrievers are susceptible to thyroid problems, which can also affect the skin and coat. Bathe your dog regularly, but not excessively. Labs usually enjoy water, and during the summer, you can give your dog a bath every two weeks or whenever her fur begins to feel greasy. This can help loosen up excessive hair and make it easier to comb out. Use an oatmeal-based bath to soothe dry, flaky skin, and thoroughly rinse all the suds off of your dog. Dry your dog with a towel and allow him to shake off. Dogs are easiest to brush when they are damp, but not soaking wet. Brush your dog, starting at the front and working backward and then down, using a wire slicker brush. This removes excess fur and can also help to loosen up and alleviate dry skin. Then use a shedding blade on your dog. These loop-shaped instruments help to remove excess fur and can dramatically reduce shedding. Holding the blade so that the loop is against your Lab's body, brush gently in one direction only, starting at your dog's neck and working back toward her hips. Brush her chest, tail and belly last. Continue using the blade until you are no longer pulling out clumps of hair. Newer de-shedding tools on the market feature double blades and are extremely effective when used carefully, combing only in the same direction that the fur grows; otherwise, these combs can yank it out. Fish oil can help to improve your dog's skin and coat. Ask your veterinarian about supplementing your dog's diet with one fish oil capsule each day. Give your Lab high-quality treats as you groom her to help develop positive associations with grooming and to reduce anxiety.